Suspended in the Minneapolis Convention Center Plaza, MIMMI is a large, figure-eight-shaped piece of inflatable art tasked with gathering the collective mood of the city and then expressing that disposition using colored lights. 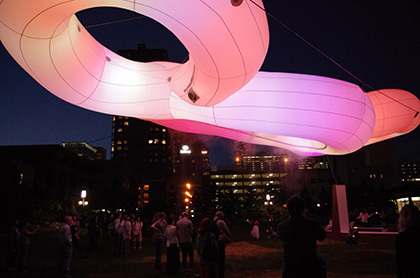 According to the City of Minneapolis website, "MIMMI analyzes this information in real-time, creating abstracted light displays and triggering misting in response to this input, creating light shows at nighttime and cooling microclimates during the daytime. Whether the city is elated following a Minnesota Twins win or frustrated from the afternoon commute, MIMMI responds, changing behavior throughout the day and night." Amazingly, MIMMI can also detect movement in the Plaza and incorporate that information in with its analytics. Congratulations and thanks goes out to the design team that includes INVIVIA with Urbain drc as project developers. The design and technology team members are Allen Sayegh, Carl Koepcke, Jack Cochran, Yuichiro Takeuchi, Bradley Cantrell, Artem Melikyan, Ziyi Zhang and Peter Mabardi. And us? We were the inflatable manufacturer providing design, development and construction of MIMMI as well as the material that will grant her a sense of immortality. You see, in addition to being extremely cool, MIMMI is also recyclable. When the display is finished (at the end of summer), MIMMI's material will be made into raingear (in the form of ponchos) and sold. That ought to put the whole city in a good mood. Looking for more inflatable art installation ideas? Browse our online inflatable galleries!